The next iRacing build is just a week away, and a recent forum post by iRacing president Tony Gardner shared more details about which content will be — and won’t be — in the service’s quarterly software update. Taking top billing is still the new dynamic time of day, or day-night transitions, feature. Gardner called it “a big project” but said the developers have been working weekends to ensure it will make the December build. At the initial release, users will have access to options such as being able to choose a starting date/time and sun movement speed for hosted sessions. Later, Gardner said they will work on adding additional features, including implementing high dynamic range (HDR) rendering. The sun setting at Daytona. Image still from an iRacing tweet. Other goodies in the build include the previously confirmed addition of the Tsukuba Circuit and the Charlotte Motor Speedway ROVAL as part of the free base content package. iRacing also recently announced that the current-generation Dallara Formula 3 car will be released in December, and Gardner teased an updated crowd system and “maybe another surprise car you might hear about soon”. Ongoing development projects that won’t make this build include at least two features currently in alpha testing. The new XAudio2 sound engine is being optimized and debugged according to Gardner, and the V7 tire model is working on a few cars at the moment and will likely be released “on a broader range of cars” in the March build. AI also needs to have “a few distracting issues” fixed before it’s released, and the new damage model remains in development “but we are making significant progress”, said Gardner. With confidence increasing that day-night transitions will make the December build, it’s likely that the NEO Endurance Series has run its final race with a static time of day. Series co-founder and director Niel Hekkens said he is actively planning how NEO may best incorporate the new feature beginning with next month’s 6 Hours of Interlagos. “Right now, we have an idea of how we will use different in-game starting times, as an attempt make the racing more dynamic,” said Hekkens, adding that he’s waiting to see which options are available and just how extensive the initial implementation of dynamic time of day will be. Because the next two tracks on the schedule — Interlagos and Suzuka — don’t have their real-world lighting sources modeled, Hekkens cautioned not to expect any nighttime racing at either circuit. 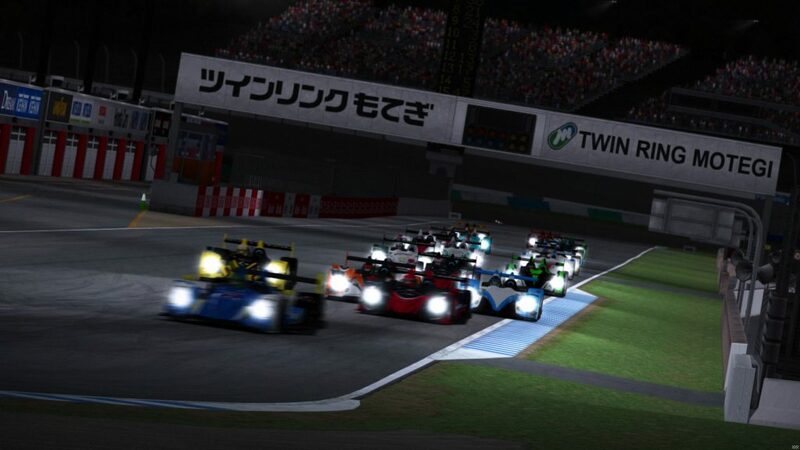 Night racing last season at Motegi. Image courtesy of Jamie Wilson. “At the moment we have a global idea, but don’t want to run into full darkness just yet,” said Hekkens, hinting that an early-morning start or late-evening finish would be more likely for those races. For February’s 6 Hours of Spa at the Belgian circuit that already has its trackside lights working in the sim, Hekkens said he would consider running part of that race at night, but noted that “Spa is still a couple of months away and we will use the next two rounds to learn more about the dynamic time of day feature”. 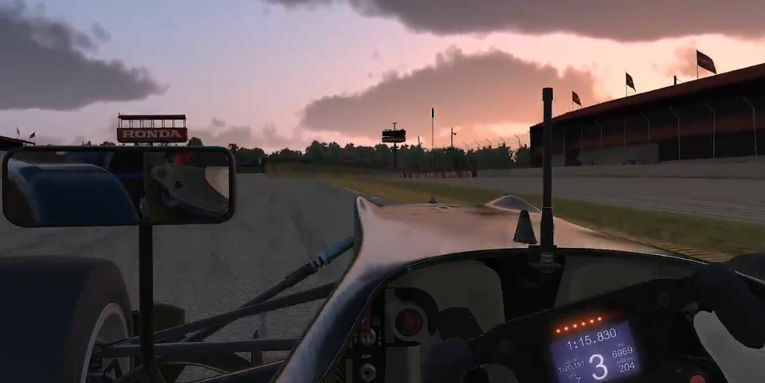 Overall, Hekkens was excited about what this new feature — and others that follow it — mean for endurance racing on iRacing. Several teams will be hoping that the new time of day feature includes the ability to turn back the clock on a sluggish or problem-filled start to their NEO seasons. A look through the standings shows several expected contenders in each class near or below the eighth-place cutoff to automatically qualify for next season. After being damaged in a lap-1 crash at COTA, Thrustmaster Mivano Racing’s #4 team sits sixth overall, just 3 points ahead of eighth-place Virtual Motorsport. A DNF at Sebring and a seventh-place finish at COTA has Team Chimera in thirteenth, while AVA Vervatic — the sister team of the P2 points leader — is in sixteenth. The UI1-Positive SimRacing #27 P1 car and the Team Eighty-Four Porsche come together at COTA. 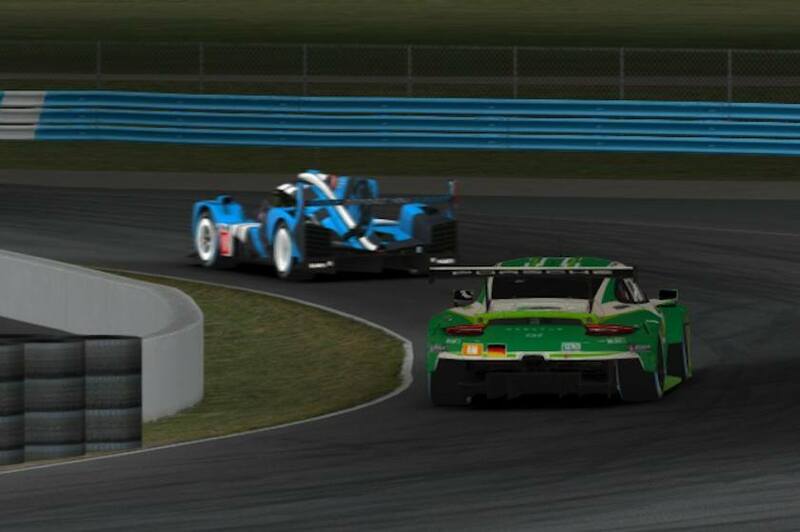 The battle for automatic invitations in the P2 class is a tight one, with a three-way tie for seventh between Team Heusinkveld, SRN Motorsports, and UI1-Positive SimRacing. After winning their DGFX class championship last season, the LuxSim24 MOATF Podcast team has some work to do in their debut NEO season, currently sitting eleventh in points. As expected with such a close field this season, the fight for an invitation in the GT class is especially competitive. ZENNITH eSport, SimatoK eSport, and Torque Freak Racing are currently tied for eighth place with 14 points a piece. The two multi-car teams in the class — the Team Eighty-Five and Team Eighty-Four combo, plus the Williams JIM Esports #96 and #97 entries — combined to score just one point at COTA, which dropped them all down the order in the standings. Williams is in the biggest trouble, with neither of its entries having scored points this season. The DGFX League — one of NEO’s partners this season — didn’t have to wait until December to race under the lights. 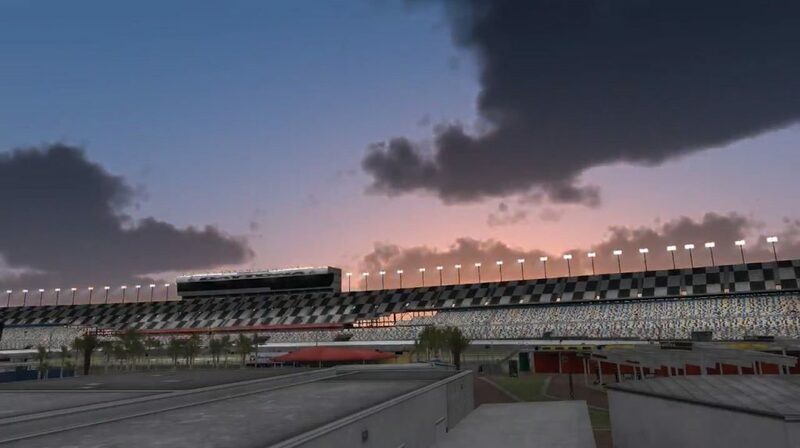 In its latest event earlier this month, the endurance series hit the high banks and infield road course of the Daytona International Speedway for six hours of nighttime multiclass racing. In the P1 class, the Kinetic Racing Porsche 919 Hybrid driven by Mattias Magnusson and Marc Torres scored the victory ahead of SimatoK eSport and GTTempel Racing. The Silverstone winners, Scuderia REC, finished as the final car on the lead lap in fourth. A pair of current NEO competitors took the win in the P2 class, as Ronny Fantini and Christian Kiewitt from Team Heusinkveld piloted the team’s HPD ARX-01c to the top of the podium. FitzSty Motorsport was second and NOMAD Sim Racing was third but leads the class standings after two rounds. Racing through the Daytona infield in DGFX action. Image courtesy of Fischer Motorsport. The battle for the win in GT Pro came down to the final corner, as Mikey Grems in the vApex Racing Group Ferrari 488 GTE pulled out of the draft entering the tri-oval and narrowly edged the LuxSim24 MOATF Podcast Porsche by half a car length to take the victory. The GermanSimRacing Ferrari crossed the line in third, and 11 cars finished on the lead lap in the class. On December 8, DGFX heads to the Barber Motorsports Park — a bullring by road course standards at just 2.38 miles — which promises to test teams’ abilities in traffic over four hours of racing. After 10 full-course cautions at Daytona, expect to see more of the same at Barber. Last weekend, the MOATF podcast hosted its Race of the Decade — a pro/am charity event supporting the Make-a-Wish Foundation. 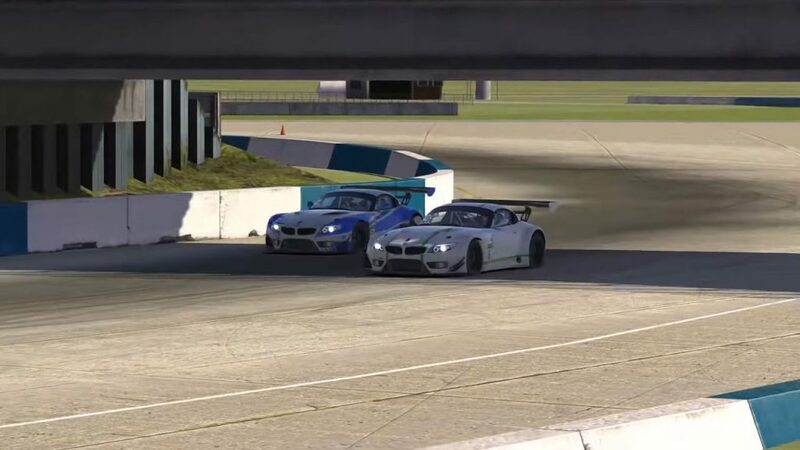 The event saw top road racers, streamers, and even iRacing chief steward Nim Cross partner with paying drivers for 2 hours and 40 minutes of racing at Sebring. 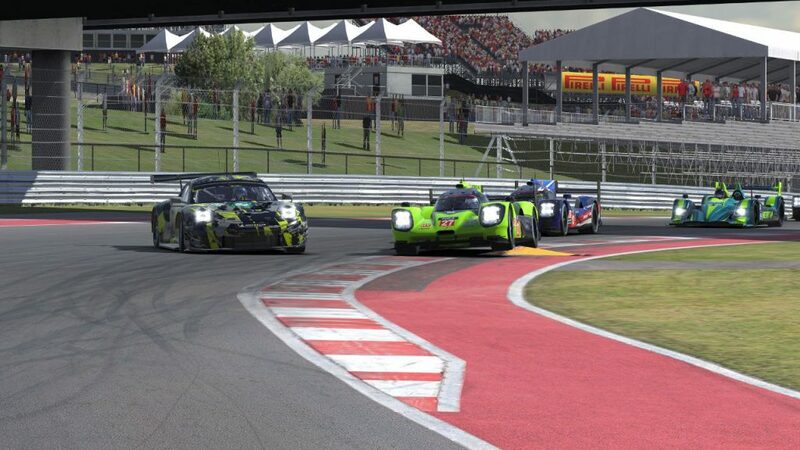 In the GTE class, Maximilian Benecke and Paul Antcliffe scored the overall victory by 25 seconds ahead of iRacing world champion Martin Krönke and teammate Chuck Chambliss. Moritz Löhner, who runs with the #97 Williams JIM Esports team in NEO this season, finished in fourth driving alongside Edward Lack. Kaz Oomishima (right) and Lewis Goodway battle on the final lap of the Race of the Decade. Image still from the RaceSpot broadcast. The GT3 class saw current NEO competitors on each step of the podium. The MOATF Podcast BMW driven by Kazuki Oomishima and Neil M. Andrews — of MOATF’s #44 P2 car — took the win after Oomishima made a last-lap pass on Team Buschfink Racing’s Lewis Goodway, who drove with Samuel Dougherty. Jamie Fluke from the Apex Racing UK #60 P2 team finished third driving with Scott Newton. Buschfink’s Fraser Williamson also competed in the race but finished eleventh in class. In total, 24 teams competed in the race, which MOATF said raised more than £6,000 for Make-a-Wish UK.